@Oliver: No, but we do know they are still struggling with the MGU-K seal. Hopefully they will be back out soon. But don't get the impression they are all just standing around the car, there will be intense work going on in the garage to get to the bottom of the issue and engineer a fix. How many laps will McLaren last at the first race....i'm betting 15. Had RBR got on top of their problems at the final test last year? @Russ: Red Bull were having problems right up until the final test last year. On the penultimate day in Bahrain the car completed just one lap! However, they did have an understanding of the issues and were able to fix them in the short period before Australia - it is not clear whether McLaren is yet in the same position. 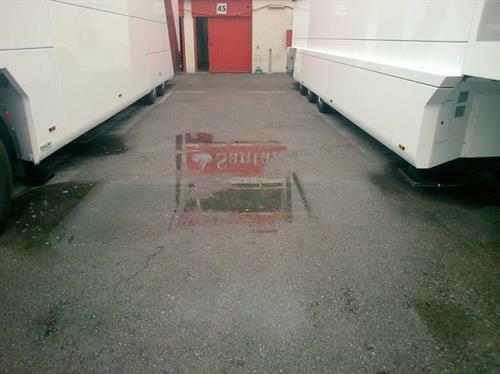 Are the force india cars at the track today? @speedf1: The new Force India VJM08 is being prepared to leave the team's base in Silverstone today and will arrive in Barcelona tomorrow. The team is hoping to complete some laps in the afternoon before two full days of testing at the weekend. Why Toro Rosso haven't set any timed lap even after 24 laps ? @SK: Most likely pit stop practice. If the car keeps returning to the pits at the end of each lap rather than crossing the finish line then it will not register a time. Just saw pictures of the Mercedes today and yes indeed, a totally different shaped camera support, although still a bit aerodynamically shaped and look at the way these supports are mounted on fine stacks. So not directly on to the bodywork. A solution we haven't seen yet! I'm hearing reports of drizzle on twitter, I know you guys are not the weather service, but do you think the interruption will be long? @Andreasjsn: It's drizzling right now. It all depends on what the teams want to test and how desperate they are. It's been a bit overcast all day so it might hang around for a while. Could the Mercedes camera mount be a distraction of sorts... you know, to get the teams thinking of solutions for a area they know has little chance of getting past the FIA and therefore wasting precious resources of competitors. A long shot I know but this is F1 we are talking about. @WayneBond: I very much doubt it. The FIA tends to clampdown on areas which it thinks will lead to extra spending and are borderline in the regulations. The latest ruling on the cameras means Mercedes has come up with another solution, which is not as positive for the aero but not a major downside either. @kathy: I would say that's proof that the headline times are not a good guide. The car hasn't got any slower (Ferrari will be making sure it is faster) but fuel loads and run plans have changed since the first test. The Ferrari is probably capable of a quick time here, but they are currently working on heavy fuel runs rather than low-fuel headline grabbers. Is it 3 days or 4 days in this last test session? @speedf1: Four days, from today until Sunday. @AM: Soft to medium should be somewhere in the region of 1.0s. But because the soft works better in low temperatures some teams are reporting as much as 2.0s. It also depends on cars. You will have noticed that drivers often complain about tyre warm-up at race weekends, well, it's the same here except more extreme. Some cars will be better at getting their tyres up to temp, but that might actually prove to be a disadvantage once we start racing in extreme heat in places like Malaysia. Tyres are never an exact science, so it's hard to give an exact delta between the compounds. 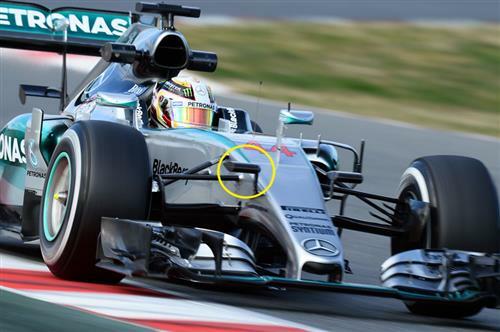 How it was the shape pf the camera used by Mercedes last week ?? @MelhemSakr: It was more of a sculpted curve mounting the camera rather than an upward stalk. The drizzle continues to come down and the track remains empty at the moment. 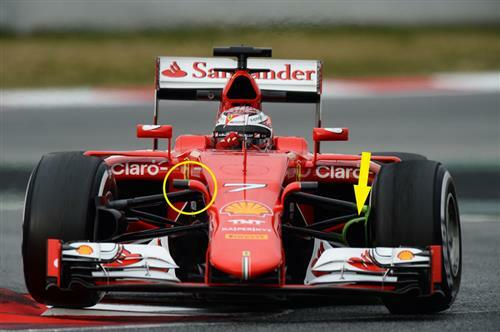 Here you can see the Ferrari's camera mountings, which haven't changed. We expect them to also make alterations before Aus. 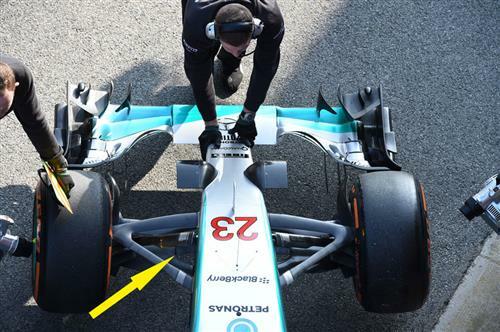 The arrow is pointing to the enlarged brake duct for the blown wheel nuts, which is covered in aero paint as they appear to be testing its impact on the air flow behind. I am off to a Ron Dennis press conference. Should be an interesting insight into Alonso and what his take on testing so far has been. Stay with us for updates on my return. But don't hold your breath! 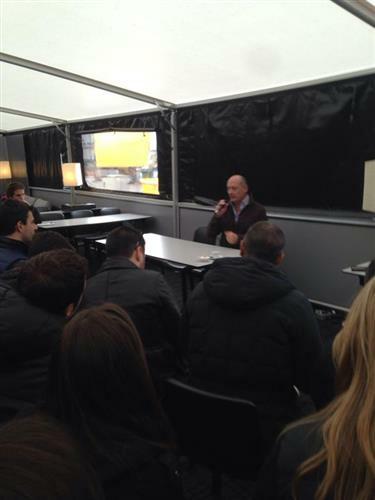 Ron Dennis press conferences are never shorter than 30 minutes. Nate is making space on his dictaphone as I type. So maybe the FIA should design a camera mount that is the same for all teams. @IanAU: The camera is the same, but where the team chooses to mount it is dependant on its design. What if an FIA standard mount disadvantaged one over another? This is nothing new, however, Red Bull installed the camera inside the nose last year before it was told to make changes by the FIA. The latest Ron-speak of 2015! keep us posted. @JasonArellano: We will. My favourite Ron Dennis quote from the Alonso and Button announcement last year was "Happiness isn't a tambourine thing, it's about state of mind". @Laurence. 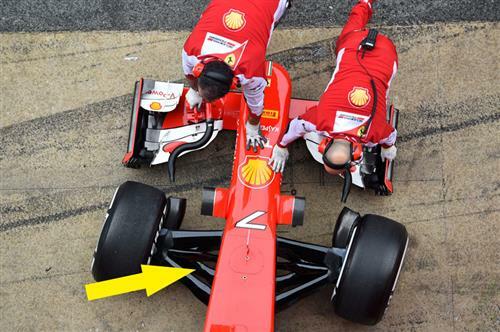 Is there a limit on the amount of tires and different compounds available during testing? @Marais: Each team is allocated a total of 110 sets of tyres for testing purposes throughout 2015, down from 135 last year. They can choose which compounds they want and then Pirelli occasionally supply development tyres on top of the allocation. 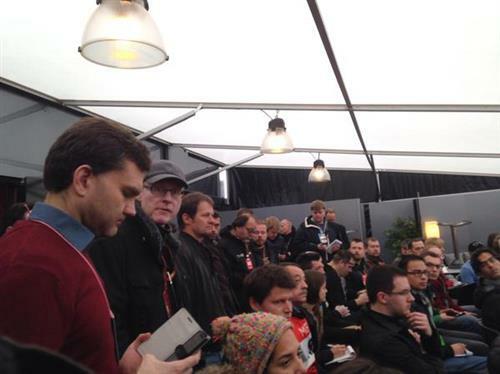 @Kumar: Nate is currently down in the McLaren hospitality listening to Ron Dennis and Eric Boullier. However, I can tell you from my experience that they are not quite as spectacular as the race motorhomes. Some are just solid-sided tents and some teams share in order to save costs. However, the staff working inside are mostly the same crews that appear at races and keep journalists fuelled with coffee and lunch if you ask nicely. Mercedes has the best testing motorhome (a DTM unit) and Red Bull and Toro Rosso both have impressive structures too. Next 3 days should be dry. Perhaps a a little drizzle in the morning, but that's all! But still no temperatures like we can expect at the GP's this season. 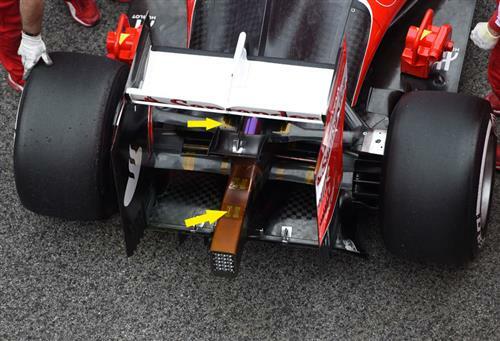 Here's the rear of the Ferrari, covered in temperature sensors which is a usual sight in testing.